Home › Gallery › Print (image) › Open Book	› Is This The Only Local Sci-Fi You're Reading? 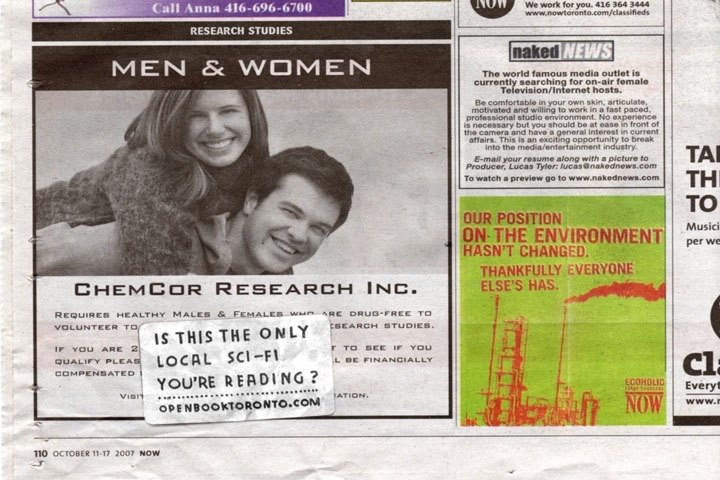 Open Book Toronto: Is This The Only Local Sci-Fi You're Reading? Open Book Toronto and fellow Canadians, TAXI launch a four week guerrilla campaign to increase traffic to their website, openbooktoronto.com. Strewn across the city will be wild-postings, TSA’s, posters, subway ads and ambient pieces promoting the company's cause: provide an outlet for local literature. 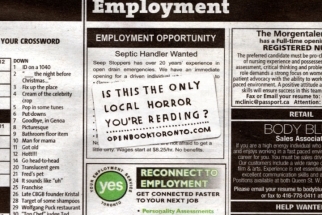 The campaign appears to be a generic supermarket tabloid ad for dating services or classifieds, but a clever sticker affixed on the bogus ad inquires about the individuals reading habits and directs them to Open Book's site. According to Open Book, the campaign seems to be generating buzz, directing more readers to their site than Google is.